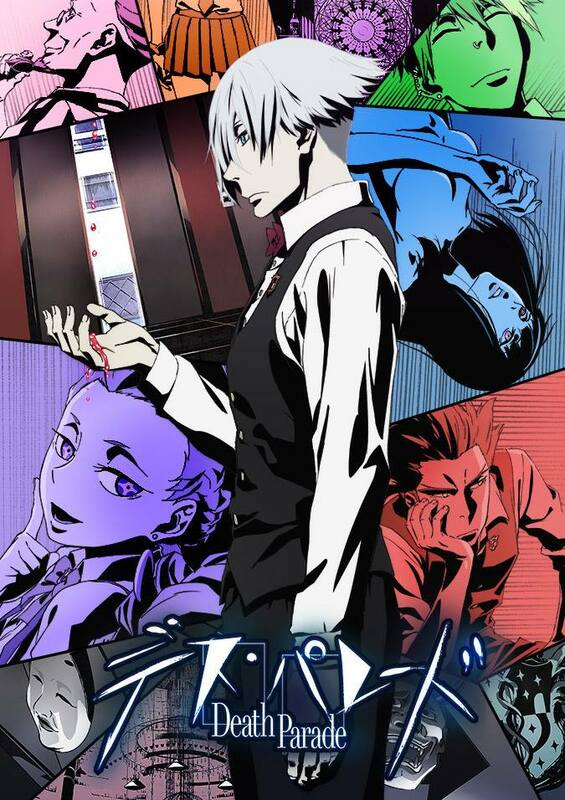 The moment of truth has arrived – after eleven episodes, it is judgement day for Chiyuki as Decim must make the call of whether she is worthy of redemption or not. For a series’ finale, ‘Suicide Tour’ leaves something to be desired but at the same time, as an episode itself, it is incredibly well done. 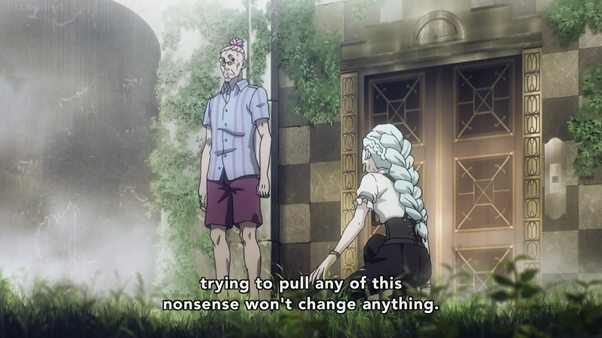 On one hand, it felt like certain conflicts between characters, or even within the characters themselves, were left hanging or dealt with half-heartedly but on the other hand, the episode took long stride towards addressing some of the series’ more obvious deficiencies. For instance, giving Chiyuki’s death and its subsequent fallout additional screen time this week, gave the audience more time and reason to form that all-important emotional attachment to the character and her situation. Chiyuki’s fate and Decim’s decision have undoubtedly been the series’ primary plotline and while its resolution was beautifully executed, it does feel like, despite the events occurring throughout the series, virtually nothing really changes in the big picture. While that’s not necessarily a bad thing, it does seem like the show missed an opportunity to create a more ambitious, eventful conclusion to its story. One of the biggest disappointments in this episode was seeing how placid the confrontation between Oculus and Nona was. The cliff-hanger at the end of last week’s episode promised us a major clash between the two as their differing objectives put them at odds but instead of getting a fight (whether physical or emotional), it feels like neither side really made their case and instead, just shrugged and walked away saying ‘Let’s see who’s right, then’. What’s even more disappointing is that even by the episode’s end, the show doesn’t really resolve the tension between the characters. 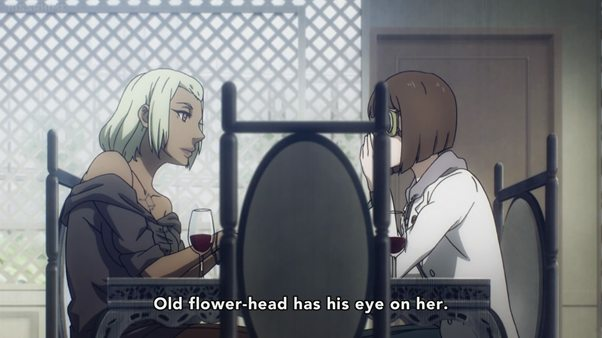 It seems like Oculus and Nona still have very different positions and nothing between them has really changed since the beginning of this episode. Had the show’s creators been a little more ambitious, they could have had the fallout of the clash-that-never-was between Nona and Oculus totally revolutionize the way that the arbiters do their duties. Instead, the conflict that could have been the finale’s high point, ends being rather insipid and almost irrelevant to the story as a whole. The reason that the aforementioned tension and potential for conflict was so important was because the Decim-Chiyuki plotline lacked it entirely. While there were certainly questions over whether Decim would even judge her at all, it seemed fairly obvious since the beginning that should it come to a conventional judgement, it would require a serious, character-breaking revelation for Decim to condemn her to the void. In some sense, knowing what Decim’s decision was before even he did, allows us to focus on the real heart of the episode – Chiyuki’s death and its aftermath. 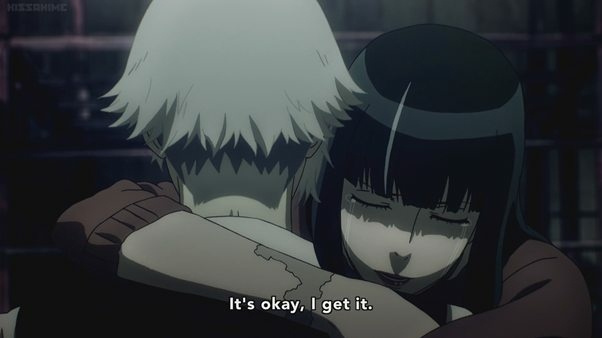 Even though the heart-breaking scene featuring Chiyuki’s mother was a fabrication at Decim’s hands, the scene finished what the previous episode began: the audience finally felt a real emotional connection to Chiyuki, and not a second too soon. With the character’s fate still to be decided, it was clear that if the audience were to ever be invested in her, it would have to be now or never. Watching her remember the various characters she has during her time as The Assistant helped tie it all together though bringing those characters (whose names the audience has surely forgotten) up again in the final episode it did feel a little forced and a little cheesy. Still, the entire final sequence of the episode was wonderfully done – watching Chiyuki’s final farewell to Decim and his terrifying attempt at a smile to seeing her legacy in the Quindecim as Decim greeted his latest customers with a genuine, warm smile right before the show’s catchy theme played for the final time. Yet, even when all is said and done, some questions linger on. Oculus seemed convinced that an arbiter with human emotions will be ruined but it’s unclear whether that’s the show way of indicating that Decim’s newfound positivity is ill-fated? Or perhaps, hopefully, it’s an indication that Oculus and his rigid rules don’t really have the right of it all the time. Either way, the show concludes by telling us that the life in the afterlife carries on just like it always has. It’s a shame that we never get to explore the other characters in the show – like Quin and Clavis, but we do get to say a final farewell to Ginti. Ginti is an interesting specimen. He remarks that his cat has run away but while there is no emotion on his face (apart from his usual grumpiness), there is a sense that he is sad that the cat has disappeared. It is small little things like this that make the show feel like such a wasted opportunity; sure, the season told the story that it intended to, but after creating such a colourful world, with interesting characters, it is such a shame that we will never get to see any more of them or their nuances. I would also like to extend my heartfelt gratitude to anyone who has been following this series of write-ups I do every week (I know there are literally a handful of you!). Any feedback you provide would be extremely valuable, so go on ahead and leave a comment if you can! You know, I was wondering about that. For a moment it seemed like she was above craving life despite what Decim showed her, but then she turned around and asked him to press the button for her. I was surprised because I thought we had reached the conclusion that putting people under emotional stress was not a good way to judge them.